Microsoft Excel is widely used by users to store crucial information. But, when users keep their important safe and secure they protect it with the help of password. This is the reasons due to which, on most of the workplaces Excel worksheets containing data are secured from passwords. It is a normal business requirement of the users to share worksheets with other people and send it to some other user outside the organization. In all such situations, users always wanted to protect their worksheets from being changed like deleting and moving of data. Therefore, users always locked Excel sheet with password. But, this might happen that you are in a situation where you either forget or lost password of protected Excel sheet. At this point, what you will do to get everything in your hands? There are number of users who look for VBA code to unlock a locked Excel sheet 2016, 2013, 2010, etc. 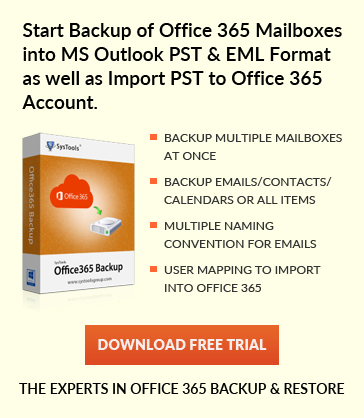 Therefore, to make this task easy for the users, multiple ways to unprotect Excel sheet. After this, it becomes easy for you to modify the document without type of restriction. How to Open Password Protected Excel File with VBA? 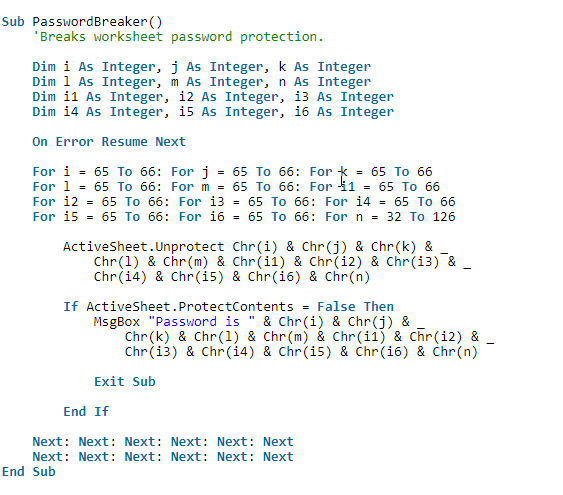 Note: Password-protected sheet must be active to run macro. 2. After that, press Alt + F11 key in order to open Visual Basic Editor. 3. Then, right-click on name of the workbook from the left pane. From the context menu, choose Insert >> Module option for VBA code to unlock a locked Excel sheet 2016, 2013, 2010, etc. 6. Now, the macro will provide you the cracked password that is not actual password but work for sure. It is some combination of A’s and B’s. There is no need to remember this fake password or use it anywhere else. You have to click on the OK button simply and your Excel sheet will be unlocked. In the case of multiple locked sheet in Excel file, you need to run the macro for each sheet one by one to unlock it. If you are using the latest versions i.e., Excel 2013 / 2016, you have to first save the document in Excel 97-2003 workbook (*.xls) format. After that, run this macro and unlock it. When your file is unlocked successfully, save it in XLSX format. How to Unlock a Locked Excel Sheet 2016 Alternatively? 5. After that, in the blank worksheet, you need choose the cell A1 and press Ctrl + V key to paste all the content in the new worksheet. After following all above steps carefully, you can use new Excel sheet without any restriction. However, while using this method, keep in mind that if Select locked cells and Select unlocked cells actions are closed in the locked sheet. In addition, if there are any external links in the Excel sheet, you have to rebuild all of them. A user either copy data or use VBA code to unlock a locked Excel sheet 2016. But both of them are not foolproof solutions. Thus, in order to have a seamless and direct approach to remove password from Excel file, use VBA Password Breaker tool. It is one of the simplest and quick method to unlock Excel sheet. Apart from all this, the application is capable to remove multilingual password also. A user can unlock .doc, .dot, .xls, .xla, .mdb file type of Excel file. It can be installed on any version of Microsoft Windows OS. Most of the users are searching for VBA code to unlock a locked Excel sheet 2016, 2013, 2010, etc. To solve this problem of users, several ways to to unlock a protected Excel sheet are discussed above. It is the most common situation that users lost their workbook password and then search for solution. Thus, in all possible scenarios, this guide will be really helpful.